Alright, that's it! I will no longer invite people to run races with me! First I take Caleb to the Human Race, and he beats me, then I invite my best friend April to go to the Nutcracker 5k with me, and she places 3rd in her age group, AND SHE WAS WALKING!!! From now on, I'm doing them alone! Other than that I had a great time at the race. 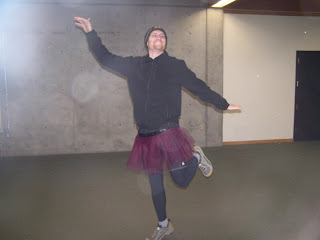 Since it was the Nutcracker 5k, tutus were recommended, so I stayed up late making them for us. It was my first attempt, but they turned out o.k. and I got pictures this time! So anyway, if any one cares how I did, I finished in 28:23 and missed 3rd place in my age group by 1 stinking minute! Okay, this is a really funny story. 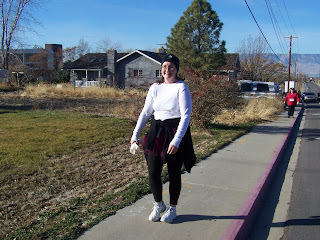 So while we were walking into the building to get registered for the Nutcracker race, we started talking with some other people who were also going to the race. We were teasing them because they didn't have tutu's. So we convinced (and believe me it wasn't hard) this guy "Ballerina Dude" aka Brandon to put on April's tutu so we could take a picture. He was a great sport! Well, unfortunately his picture didn't make the cut for my blog :), or I was just too busy ranting about not placing, but a couple days later I recieved a comment from his girlfriend wondering where the picture was. She had found the link to my blog through her cousin's blog who it turns out is also my cousin! So I think we are second cousins? I don't know but I think it's awesome! It's such a small world! Keep up the good work. It makes me tired just reading about all the miles you have run. I think I'll just keep reading about you and then I won't hurt myself. what cute little tu tu's hee-hee, actually olivia would love one of those you'll have to tell me how u did it. :) Way to go! I just get tired of thinking of running, but i do run in my sleep alot does that count?? Congrats! You guys look great! Your awesome! WAIT a minute....where is the pic with the guy in a tutu?? 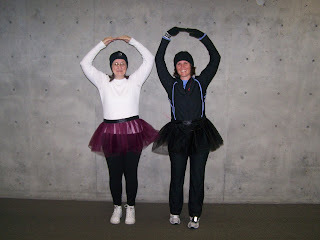 You don't know me...but I kind of met you at the Nutcracker 5K (my boyfriend was the one you got to put on the tutu). I saw your blog on my cousin's (Stacy Burgie). FUNNY! Good job on the race!!! good job on running in the cold! i can't do that. Stacy's dad and my dad are cousins!! Small world. My sister that was at the Nutcracker with me kept telling me you looked familiar!! Email them to me if you don't mind...it's t.bringhurst@hotmail.com.